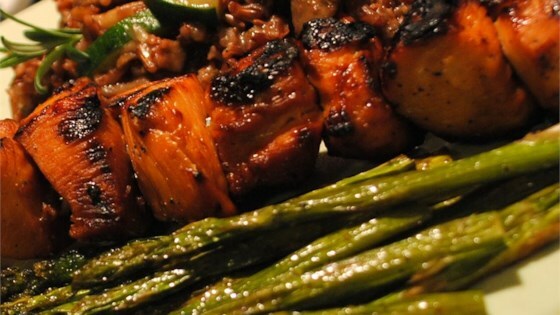 "Easy and wonderful teriyaki marinade for barbeque or roasting. For a zestier marinade, use lime or lemon juice; for a milder version, use water. If you would like to use the marinade as a sauce, you can boil it after removing the meat and add a little slurry of cornstarch and warm water to thicken it. When I make the sauce, I usually add some sesame seeds for looks. You can add fresh or ground ginger if you like, too." In a small bowl, stir together soy sauce, brown sugar, orange juice, garlic, and pepper. Pour over beef, pork, or chicken. Cover, and marinate in the refrigerator for 4 hours, or overnight. The longer the meat is marinated, the stronger the flavor will be. I didn't have orange juice, so I added some honey instead. Turned out perfect! You can adjust this marinade any way you want and it will likely turn out great. This recipe is GREAT on steak for me it lost a little bit on chicken. I did add ginger and extra garlic. I added some chopped green onion. I let my meat (beef) marinade for almost 24 hours before cooking it. This was good but I think it's missing something. Maybe rice vinegar? I'm not sure. An EXCELLENT marinade!!! I definitely recommend taking the time to make sauce with the marinade!!! this is a great sauce! I use it every time I make stir fry and my husband LOVES it! I put a pinch of crushed red pepper in it to give it a good punch. LOVE IT! LOVE IT! LOVE IT!! Love, love, love this recipe. It is so good on pork, that is the only one I use. I gave it to my sister also, and she loves it too.